The Legend of Bobby Walthour Sr.
A century before Lance Armstrong captured headlines around the world by winning a record seventh consecutive Tour de France, another American dominated the world of competitive cycling. His name was Bobby Walthour, and in the early 1900s he was one of the world's most famous and highly paid athletes. Unfortunately, due to sales rights restrictions, we cannot offer Life In The Slipstream for sale in your country. A century before Lance Armstrong captured headlines around the world by winning a record seventh consecutive Tour de France, another American dominated the world of competitive cycling. His name was Bobby Walthour, and in the early 1900s he was one of the world’s most famous and highly paid athletes. Life in the Slipstream chronicles Walthour’s rise from a lowly bicycle messenger in Georgia to a two-time national and international cycling champion who was nearly as popular in Paris and his adopted home of Berlin as he was in his hometown of Atlanta. His career parallels the surging popularity of the bicycle in America, and this biography depicts his life against the backdrop of the bicycle craze that swept America in the late 1800s and early 1900s. Readers will experience the rough-and-tumble world of professional cycling at the turn of the twentieth century, where deadly accidents and illicit drugs were commonplace. During Walthour’s long career, more than a dozen of his rivals were killed or permanently injured. He himself suffered multiple injuries—from fractured ribs and separated collarbones to mangled fingers and concussions—and was twice declared dead as a result of racing accidents. But Walthour’s fortunes on the racing circuit ultimately took a dramatic turn for the worse when his personal life began to unravel because of drug abuse and an unhappy marriage that culminated in his attempted murder—by his own wife. 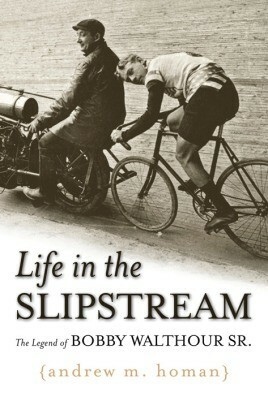 Life in the Slipstream is an unforgettable account of the rise and fall of one of the greatest athletes of the twentieth century.